Nice space (two bedrooms, kitchen with tv area ) for the price and the location. The person who brought our keys was great. We had internet. The bath has a nice hot shower. There was a clothes washer. The small terrace was nice. The taxi stand is just down the street and there is a place to get fresh orange juice, coffee and pastries right across the street. 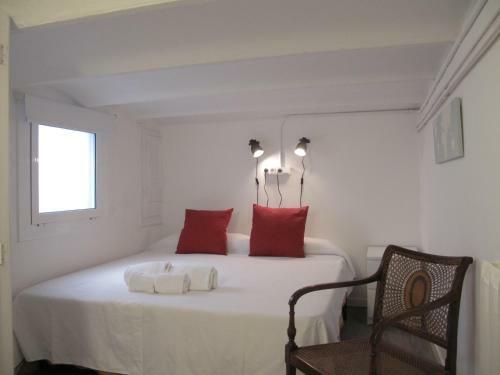 The place is centrally located, well within walking distance to Las Ramblas and restaurants. There's a newly opened convenience store nearby where you can purchase provisions. The place is secure and has security from 10 pm till morning. The apartment we stayed in was big. It had 6 bedrooms, great for our large group of 12 people. The kitchen was clean and the dining room was huge. We enjoyed the experience of staying in a traditional Spanish building. Great location, very comfortable. We were welcomed also very late in the night in person, our plane came in late. Our host Roy was very helpful. He went out of his way to assist us in having a great stay in Barcelona. He kindly printed our electronic ticket to the Montjuic Castle since we were not able to do so. (we were emailed very late that a printed copy was required) Roy also assisted us in booking 3 different airport shuttles since my friends and I were going to leave Barcelona at different times. The folder of recommended restaurants and nearby breakfast places were a bonus! We tried several of them and they did not disappoint! Location was fantastic, the apartment was the right size but was a bit basic, however this suited our needs for this trip. We loved how accommodating the hosts were, we asked for blankets and before we arrived back for the evening we each had on one our beds. The sitting room is huge and can accommodate all 12 of us. The nygth manager is really sweet and helped us. The location is literally 10 mins away from Las Ramblas. 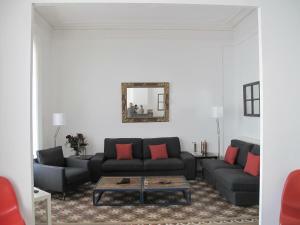 Lock in a great price for My Address in Barcelona – rated 8.4 by recent guests! 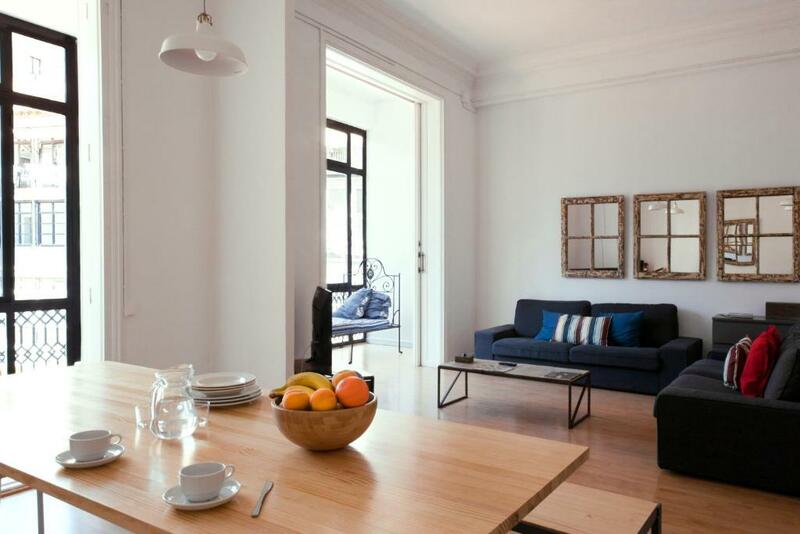 Centrally located just 2 minutes’ walk from Barcelona’s Urquinaona Metro Station, My Address in Barcelona offers large air-conditioned apartments with free WiFi, high ceilings and characteristic Modernist enclosed balconies. 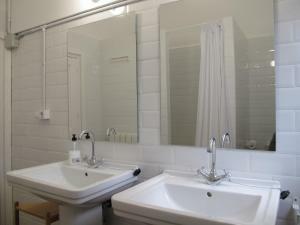 The apartment comes with 2 bedrooms and a full bathroom. Each one has a spacious lounge-diner and a well-equipped kitchen with a dishwasher and washing machine. There are lots of shops, bars and restaurants in the immediate area. You will find a supermarket and pharmacy in the same city block as the apartments. The Rambla and Plaza Catalunya’s Airport Bus Stop are within a 10-minute walk. When would you like to stay at My Address in Barcelona? 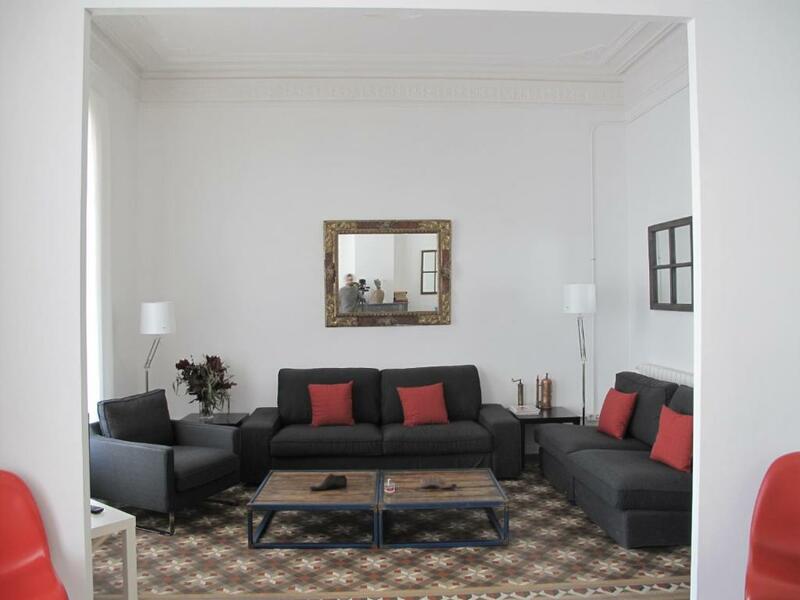 Spacious air-conditioned apartment with free WiFi, high ceilings and a characteristic Modernist enclosed balcony. It has 2 bathrooms and a separate toilet room. The spacious lounge-diner features a TV, 2 large sofas and a huge dining table for at least 10 people, expandable to 17 people. The well-equipped kitchens include a dishwasher and washing machine. Spacious air-conditioned apartment with free Wi-Fi, high ceilings and a characteristic Modernist enclosed balcony. It has 3 bathrooms and a separate toilet room. The spacious lounge-diner features a TV, 2 large sofas and a huge dining table for at least 10 people, expandable to 15 people. The well-equipped kitchens include a dishwasher and washing machine. Featuring plenty of natural light and white décor the apartment offers a double room, triple room and quadruple room. This apartment has 2 quadruple rooms, a gallery with 2 single beds, 1 double room with an private bathroom and a triple room. The living room has a sofa bed for 2 people. This apartment has 3 twin bedrooms, 1 triple bedroom, 1 quadruple bedroom, and 1 single bedroom, plus 3 full bathrooms. There is a large living-dining space and a well-equipped kitchen. This apartment features 3 twin bedrooms, 1 triple bedroom, 2 quadruple bedrooms, and 3 bathrooms, one of them en suite. There is a living space with 2 sofas and a well-equipped kitchen. This apartment features 6 bedrooms, 2 bathrooms and 1 toilet. There is a fully equipped kitchen and a spacious living room. 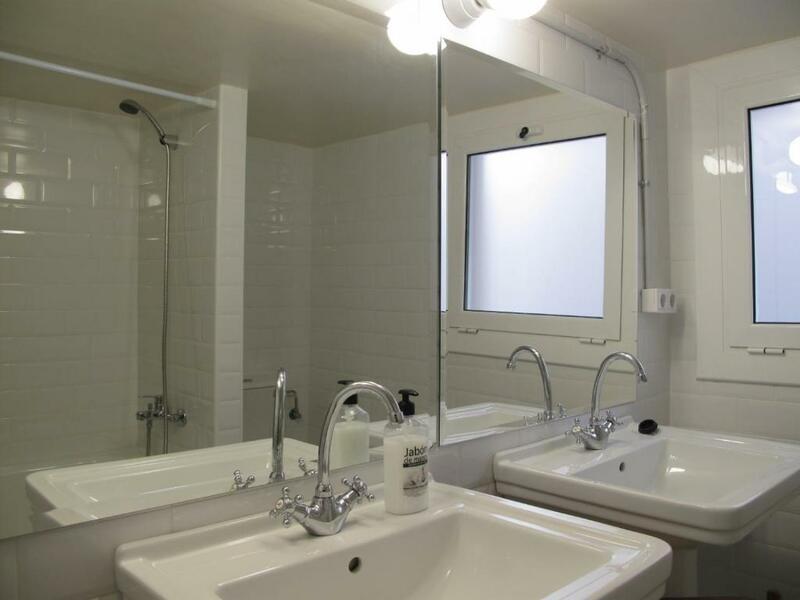 This apartment comes with 1 double bed and 1 single bed, and a bathroom with a walk-in shower. There is a fully equipped kitchen completed with a dishwasher; and cleaning products are provided. This apartment features a living area with 1 double sofa bed and one bedroom with a double bed. Beds are made prior to arrival. It has one independent bathroom with a bath or a shower. The fully equipped kitchenette opens on the living area. House Rules My Address in Barcelona takes special requests – add in the next step! My Address in Barcelona accepts these cards and reserves the right to temporarily hold an amount prior to arrival. Please inform My Address in Barcelona of your expected arrival time in advance. You can use the Special Requests box when booking, or contact the property directly using the contact details in your confirmation. Too much noise from the stairs. Especially when somebody is parting till 5 am. There was no problem contacting someone to pick up the keys, but the first person i talked to sounded bored. The elevator is great, but the elevator shaft carried all noise upstairs - laughing loud voices...at the wrong time. We were surprised to learn we had to remove the garbage. I had a problem with the internet and did not realize til the day we left that it was because of the room i was trying to use it in - one bedroom had great internet but nowhere else in the apartment. Great location! Great friendly and helpful staff! Super clean! Massive showers! Very well equipped! The property is old and hallway was dark, very hard to get hold of the property manager prior to arriving in the property, once we are checked in we were able to get hold of her easier thru phone service. The beds are quite stiff and the blankets felt itchy. There wasn't anything that we didn't like, the only minor thing is there are 2 bathrooms which are clean but a bit student like, and there was a curtain to shield the view but still when you are in a mixed group, constant coordination is required. The other ensuit was attached with the room which was fine. The pillows were very uncomfortable and there were only one each. There was everything we needed, and all in good working order. We loved the outside area, it was nice to have somewhere to sit in the evening and enjoy the warm weather and a glass of wine.